I always wanted to have a somewhat nutritious healthy snack for my children after school. However I found if I waited until they came home from school to make something they were hungry, irritable and sleepy. So I came up with a list of snacks that I could have made ahead of time and ready to eat in under a minute. My kids love this snack and it is easy to make with any type of apple. I slice up the apples before I pick up the kids from school and then zap the peanut butter when we get home. Peal and slice 3 apples thinly and lay on a serving dish, squeeze lemon juice lightly over top to keep fresh until ready to serve. I place them in the refrigerator with saran wrap over top. When you are ready to serve, microwave a cup of peanut butter until runny,drizzle over apples. Add a cup of either sliced almonds or diced pecans and sprinkle over the apples. I like to add a ½ cup of mini chocolate chips and sprinkle those over top. The kids may eat them with their hands just like nachos, Easy clean up. I found this idea while looking on Pinterest for a craft idea. We always have a lot of fruit in the house and the type varies by season. I just never thought of the kabob idea until i was browsing. So the idea is to cut up some fruit into chunks and place in bowls, buy donut holes and allow your children to make Kabobs on skewers and eat. If you do not want any mess skewer them yourself and have them waiting. I need to give credit to Together Like Family for this idea. I know my children like to feel independent so having a snack they are able to get for themselves just makes their day. I divide up a whole bag of mini pretzels and place them in sealable baggies with the right amount for an after school snack. I then place the squeezable applesauce packs at the front of the refrigerator. My kids come in and grab a bag of pretzels and an applesauce and are good to go until dinner. This is easy, healthy and refreshing. When apple season is here in the fall I make my own applesauce cups in place of the squeezable bags. Ok, I read this recipe and thought, No way, will my kids drink these, I was wrong. They sounded so healthy I did not think my children would try them. I decided to make some for myself to see what I thought. These are delicious and can be made ahead of time and stay in the refrigerator or freeze and thaw a little before you are ready to use. I can utilize in season fruit or frozen fruit and my kids can help make them.The thickening agent is Chia Seeds, yes that is right! They are easy to make in my normal blender and I usually whip up a batch on Sunday night have during the week. I found this recipe by The Yummy Life on pinterest. 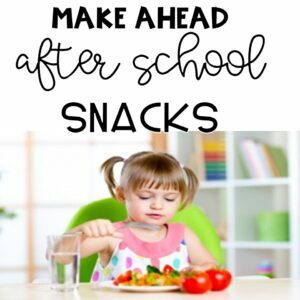 This is an easy after school snack that only takes the time to pop up toast from the toaster. I found that cutting the crust of of bread and placing it in the refrigerator makes it kid friendly. I place peanut butter in a small container and raisins in a bowl use a butter knife for children to spread. When we come home from school I put the toast in the toaster and then allow each child to spread on peanut butter, which spreads easier on warm toast. They then can make their initials, a smiley face or a picture with raisins. My kids always eat it and we use apple butter as a substitute sometimes. During the Fall this easy snack utilizes all those great apple flavors from the local orchard. I cut up my apples ahead of time into thin slices, shake lightly in bag with lemon juice and store in refrigerator. Place buttered slices of bread in plastic bags with cheese slices in between every 2 slices. I use white american, provolone or extra sharp cheese.All I have to do then is come home and add apple slices to each sandwich, grill it on a stove top griddle as if making a grilled cheese sandwich and serve. I always cut into quarters for an easier finger food. This make ahead treat is a twist on rice krispie treats using white chocolate instead of marshmallows. The peanut butter with the final addition of mini chocolate chips makes it almost taste like a krispy peanut butter cup. These are easy to make with all of your melting done in the microwave. The kids can sprinkle on the chocolate chips or you could also shave some dark chocolate for the added health value. Store in a cool place or the refrigerator. I found this recipe by the Neurotic Baker to be easy and delicious. This is an easy recipe found through Betty Crocker. 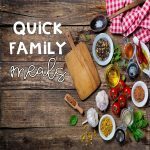 This is a two ingredient recipe that keeps well and can be made on Sunday to prepare for the week. It is also versatile because it goes well with veggies and fruit or graham crackers and animal crackers. My kids use as a dip or a spread and I have made it in multiple flavors. I originally found this recipe on pinterest and it is by Early Bird Mom. It is a keeper on my quick list of snacks. Oats, shredded apples and walnuts are healthy and the fact that this recipe is not high on sugar makes me happy to serve them. The muffins are easy to make and store well. My kids like to help make these on a Sunday night so they can have a warm muffin as a snack before we store them. They are good served with cream cheese spread on them or to eat alone. This recipe is by Living Well Mom and we make it often. All She Cooks is bound to be a hit in your house. A way to make your own fruit roll ups! My children think it our very own secret when we make these treats. They have a great flavor since they are made from fresh strawberries. When we have these in our refrigerator there is no question about what the afternoon snack will be. This is cooked on top of the stove and then low baked in the oven and cooled. The final product is ready to eat the next day. This recipe is by Epicurious and comes out perfect with following the directions exactly. How easy is it to put a snack in the crockpot for when everyone come home from school. I always allow myself 15 minutes to prepare this for the crockpot before leaving for the day. When we come home from a day at school the house smells great and snack is ready. There always is enough left over for the next few days. I put into serving size baggies for later in the week. This recipe is by The Spruce, I recommend it all the time for busy moms. These are so good and are a healthy light snack.They are also gluten free in case someone has allergies. They are easy to make and a quick easy treat for after school. They can be frozen to last longer and are good heated in a toaster oven or microwaved for less than a minute. This recipe is by Drericz, Living the Abundant Life. I am sure every parent has a trail mix recipe. This recipe is truly healthy and easy to make. I use miniature pretzels, raisins, peanuts and Honey Nut Cheerios. The mix of salty and sweet as a tasty treat works perfectly and is easily bagged to be proportioned for an afternoon snack. My children each have a scoop and are assigned one particular item to help make this treat. This makes a lot but it goes quick. This is good any time of year because it is refreshing and a tasty light dessert that is not overly sweet. It has a pretzel crust, cream cheese/ cool whip layer and topped with a pineapple mandarin orange layer. My kids love the salat and sweety mixture again and it does not take long to make. It stores well in the refrigerator and makes a whole 13 x 9 pan. This recipe is by Kitchen Gidget and is a take off of Strawberry pretzel Salad. I find fruit salad to be a good cool snack and the fact that I can use canned peaches and pineapple in this if later in the season, still makes it tasted great. It is just a nice combination of vanilla pudding mix with some of the peach juice to give the natural syrup a nice flavor. I only use bananas if i know we will be eating it soon. If not leaving the bananas out does not change the good flavor.This recipe is by Spend with Pennies and is delicious.